Ama Francis joined the Columbia Law School Sabin Center for Climate Change Law in September 2018 as the 2018-2020 Climate Law Fellow. Ama’s work focuses on developing legal solutions to disaster displacement and climate migration. She also analyzes and supports the implementation of adaptive measures in small islands and least developed countries. Ama’s work at the Sabin Center cuts across issues of international law. Ama graduated from Yale Law School in 2018 where she was an active member of Yale’s Environmental Justice Clinic, a student director of Immigration Legal Services, founder of Clarity & Community, and led New Directions in Environmental Law 2018. She has interned at Earthjustice, Islands First, and Dominica’s Ministry of Health and Environment. Ama also represented Dominica at COP22. 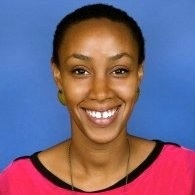 A native Dominican, Ama is a member of Phi Beta Kappa and graduated from Harvard University in 2011.